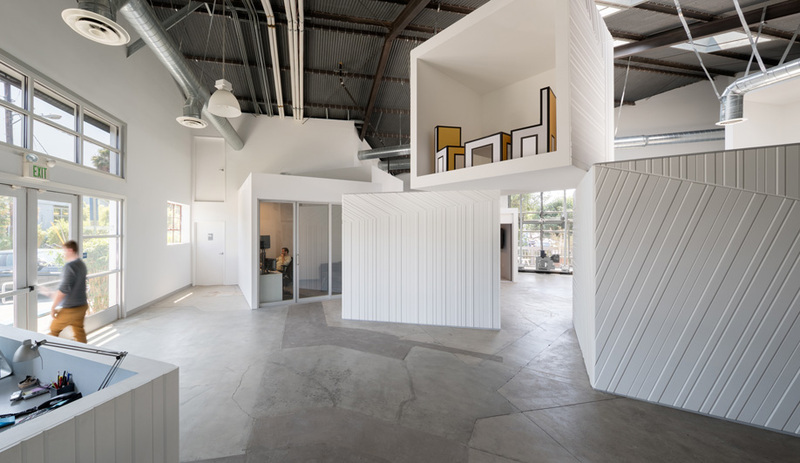 In Los Angeles, local firm FreelandBuck builds a media production studio around a small-town layout. At the edge of Culver City sits Blackwelder Campus, a landmark cluster of 25 iconic light-industry manufacturing warehouses that are transitioning into office spaces. This is where Hungry Man Productions calls home. 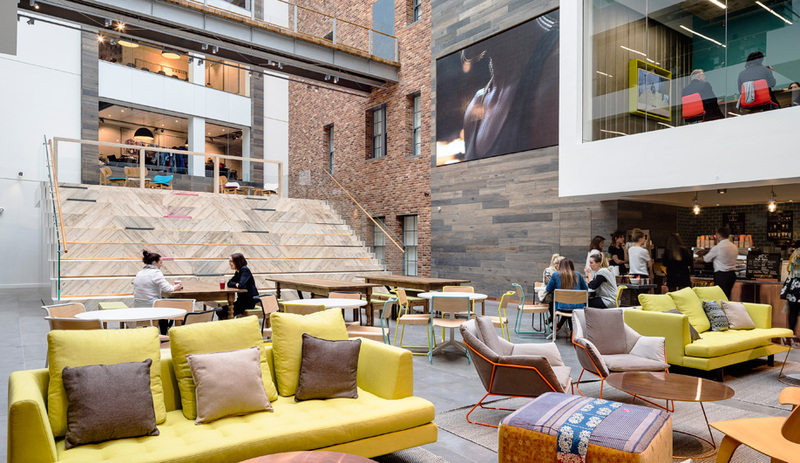 When the production company, known for its punchy Super Bowl commercials and spots for Geico and Microsoft, decided to reimagine its existing headquarters in a 743-square-metre warehouse there, it made sense to augment the building’s rich industrial history – original concrete floors, high bay lighting, and ribbed metal ceilings – with Hungry Man’s relaxed yet bouncy point of view. 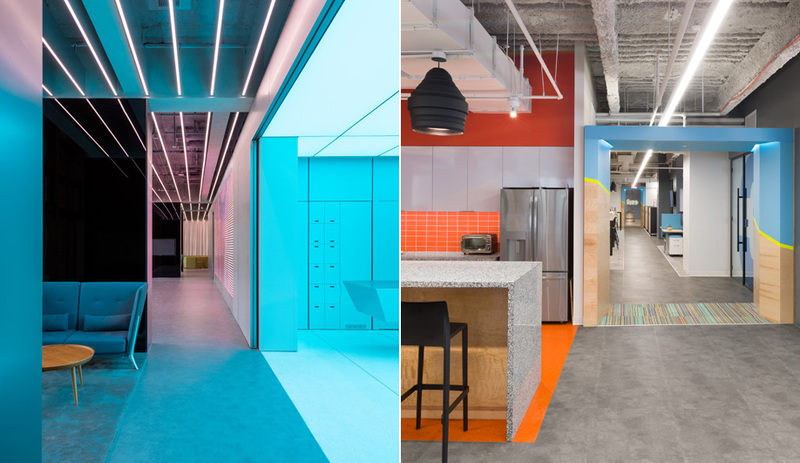 Local design firm FreelandBuck was responsible for carving out a variable, contemporary office that paralleled Hungry Man’s modus operandi: a highly collaborative workflow with configurations of different-size teams and a staff that fluctuates depending on the commission. The firm focused on materializing a fluid layout that would spark creativity and balance public and private production needs without the sensory distractions common to open floor plans. A scale model of the MDF-panelled cubes that shows the main street layout. To accomplish this aim, they started with a central “public zone” – a smooth line that flows from the front door to the rear kitchen and bar, framing the interior. The open pathway acts as the main street of a small town, while loosely arranged offices and team spaces (in the form of stacked cubes and partial volumes running along either side) mimic community buildings and storefronts. Inspiration for the interior’s identity came from an apropos desire to redefine the archaic notion of the cubicle. 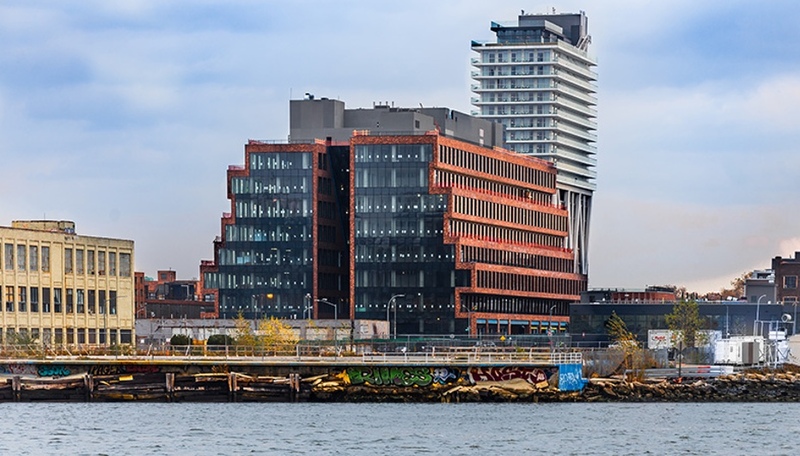 “Rather than have cubicles next to each other, we wanted to be able to maintain visual connections and relationships,” says David Freeland, who worked with partner Brennan Buck on the project. A populace of cubes, each approximately three metres squared and resembling a children’s building block, is arranged in fixed constellations that at first glance appear anarchic. 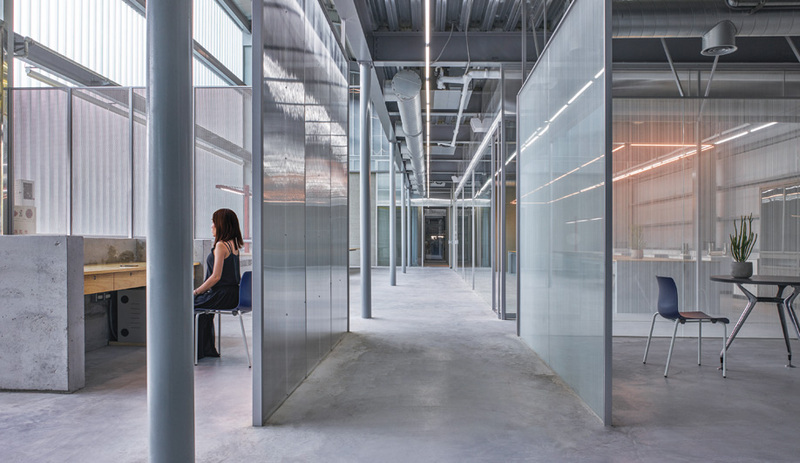 However, the configurations methodically maximize the use of space to create a functional production company office. 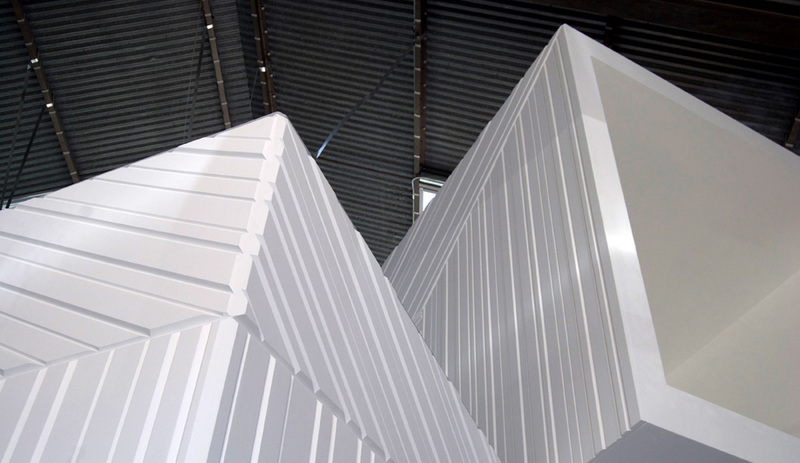 FreelandBuck turned to computer cutting methods and MDF-panelled exteriors to construct almost identical white cubes that showcase the firm’s knack for creating intriguing visual effects using simple forms. The cubes are distributed in a way that explores notions of perspective and produces optical illusions. Textured line work on each cube’s exterior experiments with geometry and layering for added depth, dimension and fluidity; depending on one’s frame of reference, the linear patterning gives the cubes a kinetic visual effect of rotating, tilting, or rising from the floor. 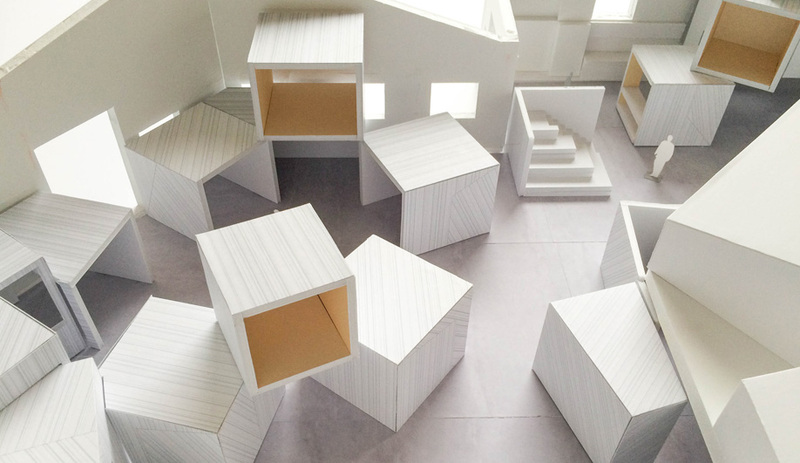 Displayed in an upper cube, FreelandBucks’ prototype furniture made from foam core provides a fun visual play on the real and the virtual. Open cubes up top can be left empty or filled with art exhibitions, props, or Hungry Man’s own creations. 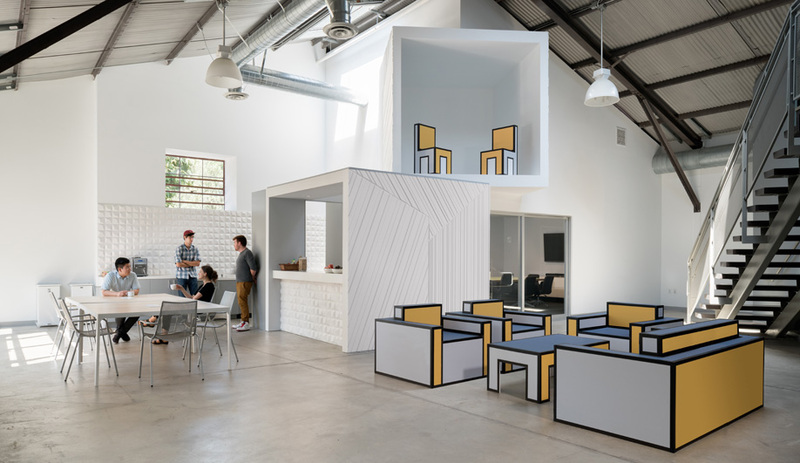 At present, an art installation of concept furniture pieces by FreelandBuck engages a playful dialogue about the virtual and the real; faux chairs and tables made from foam core are decked out in bold graphics in bright primary colours. 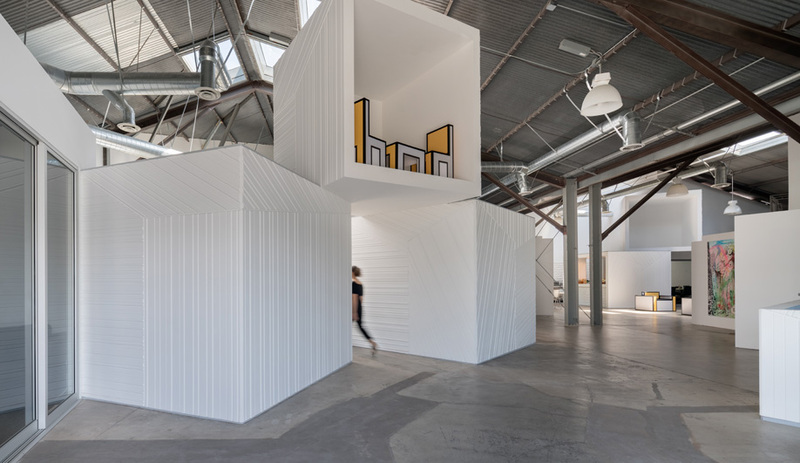 The original warehouse remains a major piece of the final design, and by integrating unexpected creative solutions and aesthetics into its office, Hungry Man can take more risks than could a larger studio or production company. An office with a fresh point of view and architecture that facilitates collaboration and communication is the real payoff.